If you can't make a trip across the pond, your next best option may be the Cornhusker State. On a 10-acre plot in Alliance, Neb., stands Carhenge  a monument that looks like the artistic offspring of Stonehenge and Cadillac Ranch. 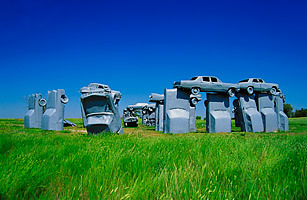 Envisioned by artist Jim Reinders in 1987, Carhenge is an arrangement of 38 autos, painted slate gray and placed in a formation mimicking England's medieval wonder. In 2009, TripAdvisor gave it the No. 2 spot on its list of the wackiest attractions in America. Unlike at Cadillac Ranch  which placed third on TripAdvisor's list  visitors should leave spray paint behind: those that don't can expect to be fined.